Emirates Group Security ran a unique interactive two-day crisis management & Hijack workshop for security industry professionals and group staff. 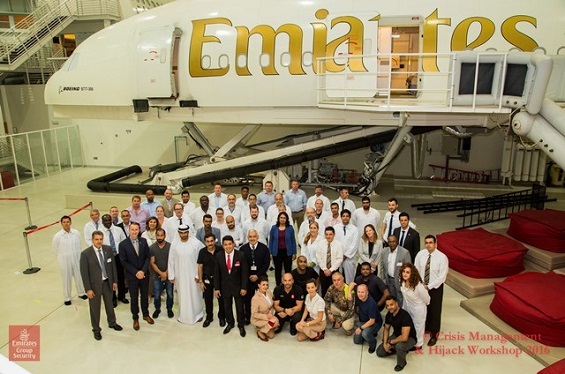 Organised by Emirates Group Security & Contingency Planning, over 70 Delegates from the globe have shared practical knowledge and training on how to manage potential hijacking and crisis situations and experienced a simulated hijack exercise. While the aviation industry is enjoying its strongest safety record in years, any segment of the industry could be called upon at any moment to deal with a crisis, emergency, or accident situation. The time and preparedness that are required to deal with today’s vastly complicated crisis situations should not be underestimated. Indeed, how an airline company handles a crisis in the first few hours, days, and weeks following a crash or other catastrophe often affects the public’s perception of the company and may strike at the bottom line. Even with the best intentions, mishandling a crisis can haunt a company for months and even years. The workshop was able to gather some “lessons learned” from various incidents presented by specialists from various industries helped to attract security professionals from around the world, who came to share their security expertise and further strengthen their defences against any potential future threats. Other presenters included facilitators from the Ground Security Training unit of Emirates Group Security, who designed and delivered content on Risk Assessment & Management. Among the participants at the Crisis Management & Hijack Workshop was Mr Abdul Mujib Mohamed Ali, Head of security of Malaysian Airline discussing the tragic fates of MH17, the Malaysian Airlines Boeing 777 that crashed into eastern Ukraine, and MH370, the Malaysian airliner that went missing on its way from Kuala Lumpur to Beijing. Mr Alistair Morrison OBE MC from the Chelsea Group has shared his experience being part of the special forces intervention in the Mogadishu Hijack incident on 13-18 October 1977; Dr.Edma Naddaf emphasizing on the Human factors element during a siege or a crisis. These points were outlined to serve as a primer for company executives and in-house counsel in advance of a crisis. The programme culminated in the UAE Army Special Forces team storming the Boeing emergency evacuation simulator after a two-hour hijacking ordeal. Dr Abdulla Al Hashimi, Divisional Senior Vice President Group Security, said: "Group Security is proud to have organised this event. State-of-the-art facilities and our close relationships with law enforcement agencies allowed our two Group Security teams [Aircrew and Ground Security] to put together this comprehensive training seminar and hijack exercise. "With the support of the various agencies and the backing of Edith Cowan University, which recognises this programme as part of the aviation security diploma that we jointly organised, we aim to build on and make this programme an annual event, which will help to raise the aviation security bar even higher in the Gulf region".